Next year marks the twenty-fifth anniversary of the publication of Nathan Hatch’s seminal The Democratization of American Christianity. Few books have had as wide an influence and impact in my field of the cultural and political history of religiosity in the early American republic. In his masterwork Hatch achieves what most scholars yearn for throughout their entire careers. Democratization crystallized an interpretative scheme (the “democratization thesis”) and shoved its rival interpretation into the historiographical abyss. The “social control thesis” had been analytically teetering for a good while before the publication of The Democratization of American Christianity but it was Hatch’s book that put one of the final nails in the coffin of that interpretative scheme’s influence. Democratization reverses the logic of “the social control” thesis arguing, instead, that the evangelicalization was a liberating process, not a reactionary one. 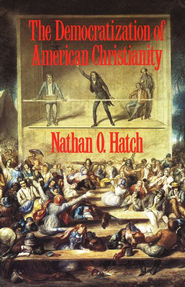 The period after the Revolution and the beginnings of the formal separation of church and state saw, according to Hatch, a rapid evangelicalization and popularization of American religious culture. New evangelical brands of Protestant Christianity arose and pushed their way from the margins of American culture to the center. With their vernacular preaching, anti-elitism, and populist appeal, this emerging evangelicalism linked well with the democratizing nature of early national political culture. American Christianity, according to Hatch, became democratized and American democracy became evangelicalized. The Democratization of American Christianity taken on its own merits has a lot going for it as a work of synthesis. Hatch’s scope is admirably sweeping and ecumenical, covering early Methodists, Campbellites, Mormons, the early post-Revolutionary African-American church, and Millerites. There is a celebratory excitement to its prose, which makes Democratization a remarkably fun read. The book also marks a relatively early foray into print and material culture studies in the early American republic with Hatch’s focus, for example, on the key role of the exchange of itinerant preachers’ journals to early Methodism. Hatch’s classic also had the great benefit of striking while the iron was hot. In the late 1980s and early 1990s, many historians of the early republic were beginning to stress that a social revolution accompanied the political one during and after American Revolution, with Gordon Wood’s (in)famous The Radicalism of the American Revolution (1992) being the clearest example of this historiographical turn. Like the “social control thesis,” however, the “democratization thesis” has some serious analytical problems and shortcomings, many of which are clear in Hatch’s classic work. Hatch blithely conflates the increasing attempts to appeal to popular tastes and desires by many Christian leaders (what could be called “popularization”) with an actual expansion of political and institutional for the laity in early national Protestantism (what could be called “democratization”). The former is certainly clear in the post-Revolutionary period but the latter much more questionable. One cannot help but wonder if “democratization” is a good theme to unite groups with such diverse church structures and churchmanship, such as Freewill Baptists, Methodists, and Mormons. To make the “democratization thesis” work Hatch, and his successors, assume much about the relationship between church and state after the Revolution. This analytic framework assumes that something like a “free market of religion,” where religious ideas competed freely without state support, formed in the new United States as the formal ties between denominational Christianity and the state governments were severed between 1776 and 1833. A close look at the legal and religious landscape of the early national period suggests that, while the religious landscape certainly became less constricted in the early republic, it was not “free” in the sense that scholars operating under the “democratization thesis” assume. The problems inherent in Hatch’s work and the broader “democratization thesis” have created a great deal of analytic space for criticism to pour forth and gradually sap its interpretative strength. Critiques of this framework have been diverse and come from many interpretive directions. Some scholars have called attention to the fact that, while the early republic saw the death of denominational establishments, an evangelical legal “moral establishment” emerged which sought to impose its values upon American society well into the twentieth century. Disestablishment, as Jon Butler has suggested, did not end “Christian concern for power and authority.” Even advocates for a sharp break between denominational Christianity and the state, such as Lorenzo Dow and John Leland, sought to leverage political authority and influence for their own ends. Contrary to Hatch, Amanda Porterfield has recently argued, in her excellent book Conceived in Doubt: Religion and Politics in the New American Nation (2012), that the emerging evangelical denominations did not march confidently into America’s religious marketplace. Rather, the new American nation was a place racked with doubt, both political and spiritual. Evangelicals sought to both exploit and soothe this doubt by blaming their denominational and theological rivals for the chronic instability of the early American republic. Massaging this doubt became the central way to bring the sometimes recusant American people into the evangelical orbit. Other critics have drawn attention to the complex, and often conflicted, relationship between race, democracy, and evangelicalization. The most powerful and persuasive version of this critique has been offered by Christine Heyrman in her Bancroft award-winning Southern Cross: The Beginnings of the Bible Belt (1997). Heyrman calls attention to the ways in which evangelicals increasingly embraced racial and gender hierarchy as they moved from eighteenth-century peripheral “dissenters” to the cultural and political center of Southern life. From this perspective it is less that the South became evangelical and more that evangelicalism became “Southern” by embracing patriarchy and slavery. While the early republic saw a rapid Christianization of the slave community in the new United States and the birth of an independent black church among free African-Americans, this spiritual flowering was always in tension with white demands for supervision and control. The need to shore up white supremacy and slavery always clashed with any African-American demands for democratization of white-black relationships within evangelical churches. A similar story holds true for Native Americans as well. Conversion to Christianity did not immunize Native peoples from exploitation by whites and expropriation of Native lands and property. The central problem faced by critics of the “democratization thesis,” myself included, is that no scholar has come up with an interpretative scheme to replace it. While, perhaps, the “democratization thesis” is teetering on the edge of the historiographic abyss, no work of synthesis has come along to give it that final shove. The closest potential executioner would be Porterfield, but Conceived in Doubt is too new and carefully argued to have such an immediate, startling impact. So, while the foundations of the analytic house that Hatch built are damaged, it still stands. From my point of view, if we are going to move beyond the legacy of The Democratization of American Christianity, we need to pay more careful attention to the role the state continued to play in shaping post-Revolutionary religious life. While expanding evangelicalism did open new possibilities to many groups with in the new American society, this was not a clear or straightforward process. It does not seem clear to me that we should describe denominational competition in the early republic as “democratic” with Mormons, Millerites, Methodists and more competing, fiercely and always honestly, for both souls and cultural and political influence. What unites scholarship working under the “democratization thesis” and that interpretation’s critics is a focus on cultural explanations for the rise and success of evangelicalism in the new United States. What might be needed is to shift the focus of our analysis towards institutional and legal factors, over directly cultural ones. Law and political conflict continued to shape denominational building and competition after the Revolution. The new state governments of post-Revolutionary American continued to be the primary force defining the religious marketplace—through incorporation laws, through tests oaths, through moral legislation, through a general tax assessment to support Christian churches. Evangelicals, and their rivals, sought to use law to shape (and reshape) the religious marketplace in their favor and at their competitors’ expense. Keeping in mind this continuing relationship between state power and religious practice might allow us to devise a new, more persuasive interpretative framework for the chaotic world of early national Christianity. Nathan O. Hatch, The Democratization of American Christianity (New Haven, CT: Yale University Press, 1989). While there are many classic examples of the “social control thesis” the best is Paul Johnson’s classic and powerfully argued work. See: Paul E. Johnson, A Shopkeeper’s Millennium: Society and Revivals in Rochester, New York, 1815-1837, 25th Anniversary ed. (New York, NY: Hill and Wang, 2004). Gordon Wood, The Radicalism of the American Revolution (New York, NY: Knopf, 1991). A mentor of mine once referred to Hatch’s book as “Gordon Wood + God.” This is unfair to Hatch, because his work was published first. Democratization was released before Wood’s more (in)famous Radicalism. It is clear that Hatch was a big influence on Wood’s argument in his seminal work. Democratization is cited in both Radicalism (as evidence of Wood’s thesis in the context of religion) and in Wood’s earlier JER article which grew into the full length book. See: Gordon Wood, “The Significance of the Early Republic,” Journal of the Early Republic 8, no. 1 (Spring 1988): 16n19. For a sweeping overview of this interpretation see: Mark A. Noll, America’s God: From Jonathan Edwards to Abraham Lincoln (New York, NY: Oxford University Press, 2002). The single best treatment of the link between evangelicalism and the emergence of a post-Revolutionary American culture is: Dee Andrews, The Methodists and Revolutionary America (Princeton, NJ: Princeton University Press, 2000). For an overview of the potential of evangelicalism increasing women’s roles in Christian leadership see: Catherine A. Brekus, Strangers & Pilgrims: Female Preaching in America, 1740-1845 (Chapel Hill, NC: University of North Carolina Press, 1998). For a sensitive treatment of the appeal of Baptist fellowship to both white and black Virginians (and the tension this caused) see: Randolph Ferguson Scully, Religion and the Making of Nat Turner’s Virginia: Baptist Community and Conflict, 1740-1840 (Charlottesville, VA: University of Virginia Press, 2008). Other examples abound in the historipgraphy. Monica Najar, Evangelizing the South: A Social History of Church and State in Early America (New York, NY: Oxford University Press, 2008). For an early powerful critique of the “democratization thesis” see: Paul E. Johnson, “Democracy, Patriarchy, and the American Revivals, 1780-1830,” Journal of Social History 24, no. 4 (Summer 1991): 843–850. Hatch describes the post-disestablishment scene thusly: “Americans who espoused evangelical and egalitarian convictions, in whatever combination were free to experiment with new forms of organization and belief. Within a few years of Jefferson’s election in 1800, it became anachronistic to speak of dissent in American – as if there were still a commonly recognized center against which new or emerging groups defined themselves.” This argument ignores that the “commonly recognized center” from which religious groups defined themselves shifted in the early republic in favor of evangelicalism (especially white evangelicalism) at the expense of everyone else. Increasingly over the course of the first decades of the nineteenth century evangelicalism became the cultural center by which all other groups were forced to define themselves – making non-evangelical denominations into a new type of cultural “dissenter.” Jews, Deists, and non-Christians remained legally discriminated against and discursively excluded from respectable civil society. Even seemingly “respectable” groups, such as the Quakers, were excluded from full citizenship (due to their refusal to take oaths) in places like Maryland well into the nineteenth century. For the above quotation see: Hatch, The Democratization of American Christianity, 7. For an examination for how a non-evangelical denomination became a new type of cultural dissenter in the antebellum period see: Robert Bruce Mullen, Episcopal Vision/American Reality: High Church Theology and Social Thought in Evangelical America (New York, NY: Oxford University Press, 1986). On discrimination against Deism and “infidelity” see: Christopher Grasso, “The Boundaries of Toleration and Tolerance: Religious Infidelity in the Early American Republic,” in The First Prejudice: Religious Toleration and Intolerance in Early America, ed. Chris Beneke and Chris Grenda (Philadelphia, PA: University of Pennsylvania Press, 2010), 286–302; Amanda Porterfield, Conceived in Doubt: Religion and Politics in the New American Nation (Chicago, IL: University of Chicago Press, 2012), 14-47, 78-112. For the problems faced by non-jurors, like Quakers, in Maryland see: Thomas O’Brien Hanley, The American Revolution and Religion: Maryland, 1770-1800 (Washington, DC: Catholic University of America Press, 1971), 56-61. My own dissertation research takes these sort of questions head on. David Sehat, The Myth of American Religious Freedom (New York, NY: Oxford University Press, 2011). John Butler, Awash in a Sea of Faith: The Christianization of the American People (Cambridge, MA: Harvard University Press, 1990), esp. 257-288. Quotation on 286. Christine Heyrman, Southern Cross: The Beginnings of the Bible Belt (Chapel Hill, NC: University of North Carolina Press, 1997). For an overview of this vein of argument: Jon Sensbach, “Slaves to Intolerance: African-American Christianity and Religious Freedom in Early America,” in The First Prejudice: Religious Toleration and Intolerance in Early America, ed. Chris Beneke and Chris Grenda (Philadelphia, PA: University of Pennsylvania Press, 2010), 195–217. For an example of this sort of experience for Native Americans see: David J. Silverman, Red Brethren: The Brothertown and Stockbridge Indians and the Problem of Race in Early America (Ithaca, NY: Cornell University Press, 2010). Nice post, Roy! As someone who works in a field that doesn’t really count on a unified interpretive framework*, I always wonder if these sorts of frameworks aren’t in the end somewhat crippling. You write that “The central problem faced by critics of the ‘democratization thesis,’ myself included, is that no scholar has come up with an interpretative scheme to replace it.” Isn’t it best for the field to not shove the wonderfully messy world of the early Republic into categories? I always saw the scholarship developing past interpretive schemes, or at least allowing several schools of thought to co-exist according to a historian’s personal and political tastes. To be fair, I think this might be what you’re getting at, but I thought I’d throw it out there and see what you have to say. *Early American Science – best thing we have to a unifying theory are those of Steven Shapin and Thomas Kuhn. Shapin deals with 17th-C England, so can’t be immediately applied to the American context, and Kuhn’s theory of paradigms, while often name-checked in papers from various fields, has been shown to be overly simple. Great post, Roy. Very clear and helpful. I’m looking forward to someone organizing a 25th anniversary conference. Will that be you?! Brian, thanks for the comment! Cambridge, thank you so much for the comment. I do agree with you that is possible (and good for scholarship) that multiple schemes or schools exist at the same time. The question, though, is which schools are valuable and which are not. As I argue above the usefulness of “democratization thesis” is played out. Nice post, Roy. I think that the biggest problem with the book is, as you point out, an issue of agency. In an effort to correct the social control thesis, Hatch over-corrected in a way that caused him to assume everyone was pretty earnest (and “Jeffersonian”), and that rhetoric matched reality. This is similar to John Modern’s critique of Mark Noll. A methodological corrective–in addition to historical correctives–to Hatch could be to emphasize, as Modern does, the context for agency, experience, rhetoric, etc., with a focus on epistemics. This is a way to use Taylor’s formulation of secularism as “conditions of belief.” What do you think about something like this, which would likely include a good dose of Foucault, as a new interpretive framework to replace democratization? Charlie, thank you very much for the comment. I too liked Modern’s book. It was very nice to see someone deflate the privileged place “common sense” theology has in in Noll’s work (and Holifeiled’s big history of theology). I am slowly re-reading Modern’s book at this very moment (not literally), it is a (overly?) complex work that rewards slow digestion (very mixed metaphor there). I may write something up about it next month, actually. I agree with you that a post-Hatch framework would likely have a very Taylorite spin. From my perspective there will also need to be a strong focus on institutions (I am a institutionalist, after all). The more I dive into my dissertation research in earnest I am becoming increasingly impressed by dialectical relationship between law and religious practice. Christian denominations in the early republic are certainly rhetorical, theological, and cultural constructs but they are also physical ones as well – in spatial sense of church buildings (and graveyards, etc.). The ability to control and maintain space seems, to me, crucial. Looking closely at church records argues the ability to both raise *and* mobilize capital was key to the success or failure of particular brands of religiosity in this period. Which, of course, is a legal process. I think much of the post-1970s scholarship as ignored this element or underplayed. Thanks again for the comment! It really got me thinking! Roy, nice post! And good to meet you at the VA Forum. I’m inclined to think the longer we can avoid a synthesis in this area, the better. That said, the idea of a conference (or something) to assess Democratization’s legacy at 25 is an interesting one. I imagine some grad students could get it off the ground, and I’d be happy to help organize to give it a shot.